Background: Definitions of sepsis and septic shock were last revised in 2001. Considerable advances have since been made into the pathobiology (changes in organ function, morphology, cell biology, biochemistry, immunology, and circulation), management, and epidemiology of sepsis, suggesting the need for reexamination. This formed the basis for the new Sepsis 3.0 definitions. Also recently the 4th update of the surviving sepsis campaign guidelines was published. For the first time parameters assessing fluid responsiveness were included and the CVP criterion was abandoned. However when adhering to the SSCG, every patient with sepsis regardless of his/her comorbidities should receive 30 ml/kg in the first 3 hours according to the SEP-1 mandate. Learning objective: This workshop will outline the basic principles in the treatment of sepsis and septic shock that underlie the need for individualized and personalized care. 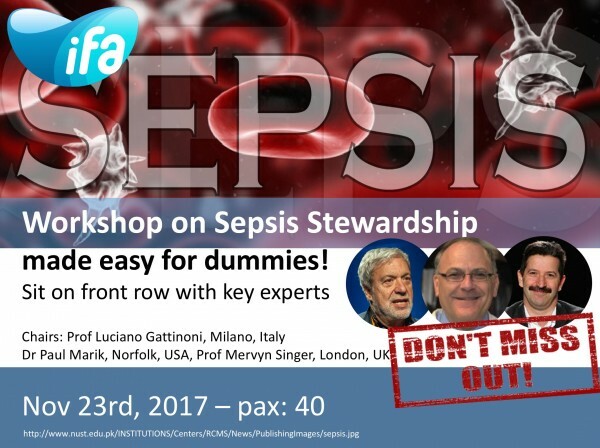 This workshop will help to understand the mechanisms of sepsis and how to implement the guidelines at the bedside. In analogy to antibiotic stewardship you will learn about sepsis stewardship. In this workshop different aspects will be discussed: the new sepsis 3.0 definitions, the updated surviving sepsis campaign guidelines, the risk of bundles of care, hot topic: decatecholaminisation in sepsis, and the future of sepsis care, given by top speakers, each experts in their field.